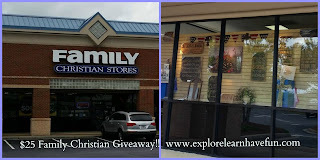 Last week I had the opportunity to visit my local Family Christian Store for a little shopping. They have some great summer sales going on and I was excited to see what I could find. We were greeted by the salesperson as we entered the store, and she told us about the awesome sales going on. 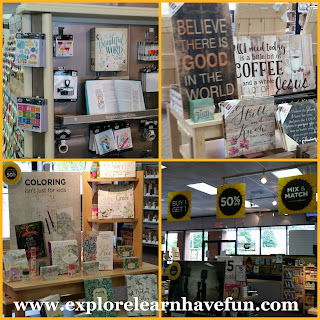 We headed back towards the journaling Bible section first, but along the way we checked out some of the other sale items! The wall art is fantastic here - so many beautiful options. 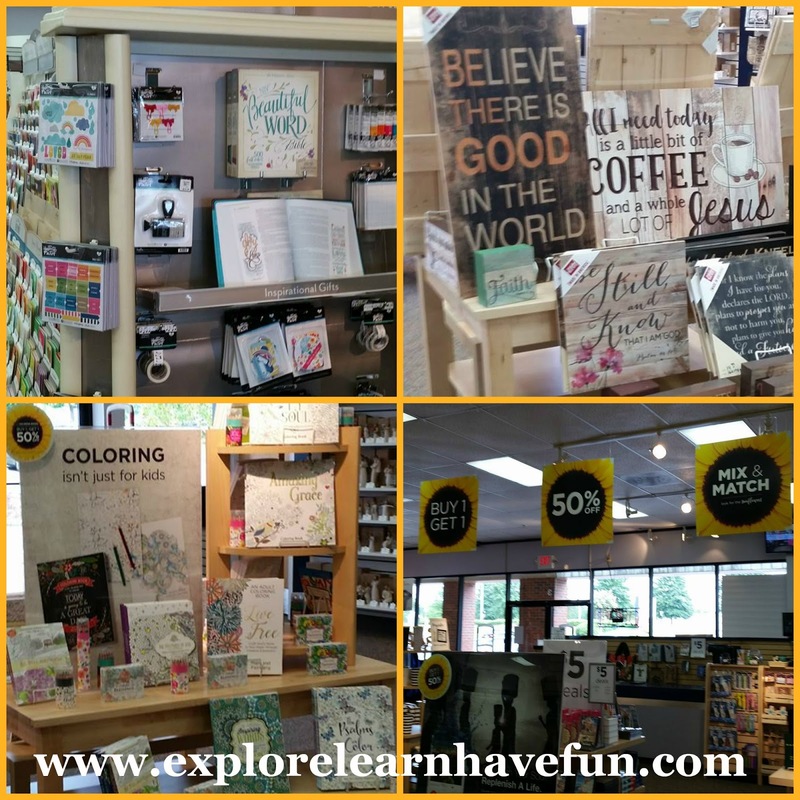 Coloring books, CD's, water bottles, greeting cards, books - they have it all at Family Christian Stores! Speaking of sales: The Family Christian Summer Sale is in full swing right now! Make the most of your summer with Family Christian’s unbeatable Buy 1, Get 1 50% Off sale on ALL Books, Movies and Music for the whole family! You can mix and match products to get the deal, which means you don’t need to shop within the same department. For example, you can buy a movie at full price, and get a book (or CD or another movie) for 50% off! This sale is going on now through August 25, so visit your local store or shop online at familychristian.com! Their website is very user friendly so shopping online is as easy as shopping in their store! 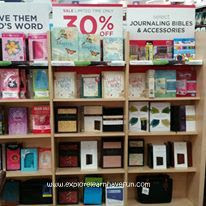 Description: Select journaling Bibles are now 30% off through August 25! Ignite a renewed passion for exploring God’s Word, whether you’re jotting down notes from a church sermon or recording prayer requests from small group—you’ll have all the space you need. And many of our journaling Bibles are filled with illustrations to inspire and get you started. Choose from 26 styles, and save now! Description: Eric Liddell, hero of Chariots of Fire, ran and lived for the glory of God. This compelling narrative is his untold and inspiring story of athletic heroism and faith in the darkest circumstances—from his Olympic medal to his missionary work in China to his last, brave years in a Japanese work camp during World War II. Description: Upon discovering her 10-year-old daughter, Anna, has an incurable disease, Christy Beam becomes a ferocious advocate of finding a solution. After Anna has an accident, an astonishing miracle unfolds in the wake of her rescue, restoring her family’s faith. Based on a true story. Stars Jennifer Garner and Kylie Rogers with Queen Latifah. We’re thrilled to be the exclusive retail partner for Active Faith Sports! Formed by a group of Christian athletes, Active Faith offers apparel with Christian-inspired designs and messages, encouraging you to share your faith whether you’re on the court, out for a jog or running errands around town. Pro athletes seen wearing Active Faith apparel include Stephen Curry, Demaryius Thomas, Clayton Kershaw, James Harden and more. Men's, women's and youth apparel available now! Family Christian is a Christian retailer, operating in 250 stores across the country. They are committed to helping you find, grow, share and celebrate your faith through a wide selection of Christian books, music, Bibles, DVDs, gifts and more. When you shop with Family Christian, your purchases support their efforts to unite with ministries that are helping children and families in need around the world. 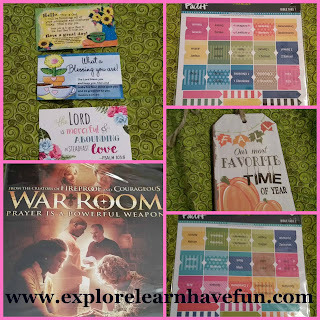 After browsing the entire store, I ended up choosing the War Room DVD, a Fall decorative "tag" that I'll hang on the back door knob in our family room, two sets of tabs for my Inspire Bible, and some little cards for sticking in greeting cards. I'm going back again soon for a few more journaling items - they had some cute stickers and other accessories that I have my eye on! The clearance section in the back is also a great place to score some amazing deals on seasonal merchandise! 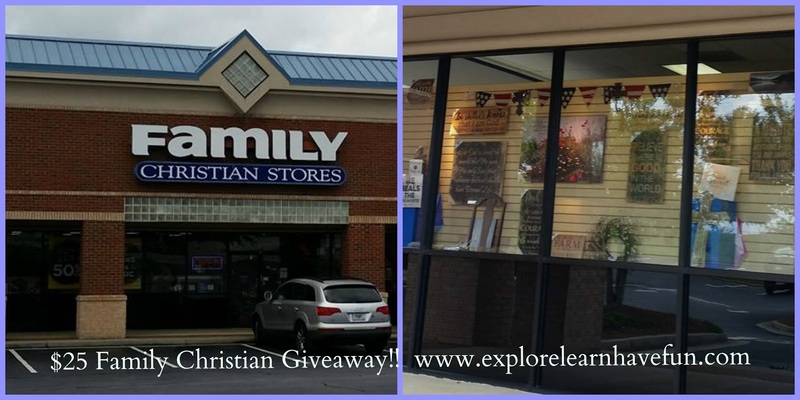 Now that you've seen some of what they have to offer, how would you like to have the chance to shop at Family Christian with a $25 gift certificate of your own? (in store or online!) They have generously offered to give one of my readers just that - and it's easy to enter via my rafflecopter widget below! Don't forget to complete the mandatory entry first - otherwise none of your other bonus entries will count! Many thanks to Propeller Consulting, LLC for providing this prize for the giveaway. Choice of winners and opinions are 100% my own and NOT influenced by monetary compensation. I did receive a gift card to shop with in order to facilitate this review, in exchange for this review and post. I'd use it for some Adventures in Odyssey goodies for my little ducklings. I would purchase a Butterfly Bible Cover. I would buy a new bible cover! I'd like to get the Be still and know boat scene art. The Miracles from Heaven DVD looks very inspiring. I would probably buy that and a TShirt. I would use it to buy inspirational music cds for my kids. If I won, I think that I would get this product: Melissa & Doug School Time! Classroom Play Set. I would purchase veggie tale books. I would get the Tri-Fold Organizer Black Lg Value. I would buy the shield necklace! has to be a good Christian movie.. I'm thinking maybe War room. I would get the Chevron Stripe Scarf - Mint! It is so cute and mint is one of my favorite colors to wear! There are some really grand movies that I would love to see. I would use the gift certificate to obtain biblical movies. New women's fiction, Adventures in Odyssey things for my kids, journals for Christmas gifts. Love Family Christian! I would buy one of the DVDs, maybe season one of Little House on the Prairie. I would get a new Bible or the Butterfly Bible Cover.